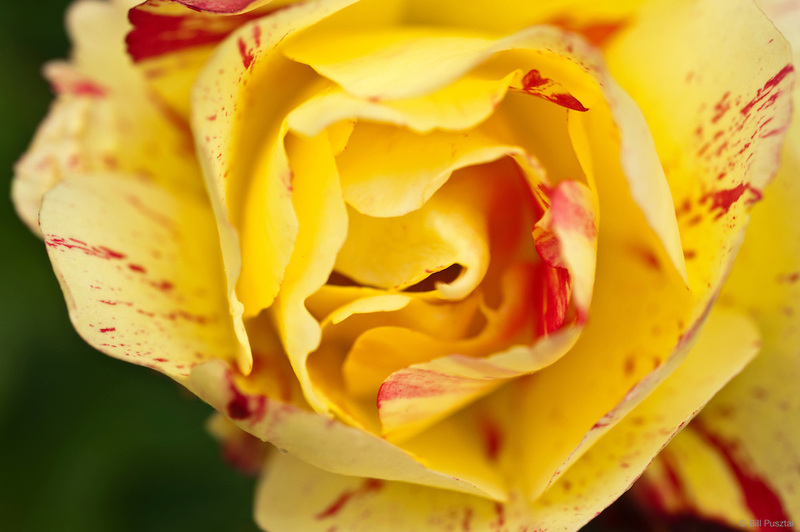 Try these plants in your garden - you will be rewarded with long-lasting and beautiful flowers. And we all know there can never be enough flowers! Hydrangea Everlasting Revolution with green tinge as blooms ageThe plant grows to about 3 ft X 3 ft with sturdy stems and deeply-toothed leaves Hydrangea macrophylla Cultivar name: 'Hokomarevo'. The color changes on a single Revolution shrub are incredible. You will see combinations of deep pink, maroon and blue blooms, all with green highlights as the flowers mature. Every color can be present at once on this heavily re-blooming shrub. 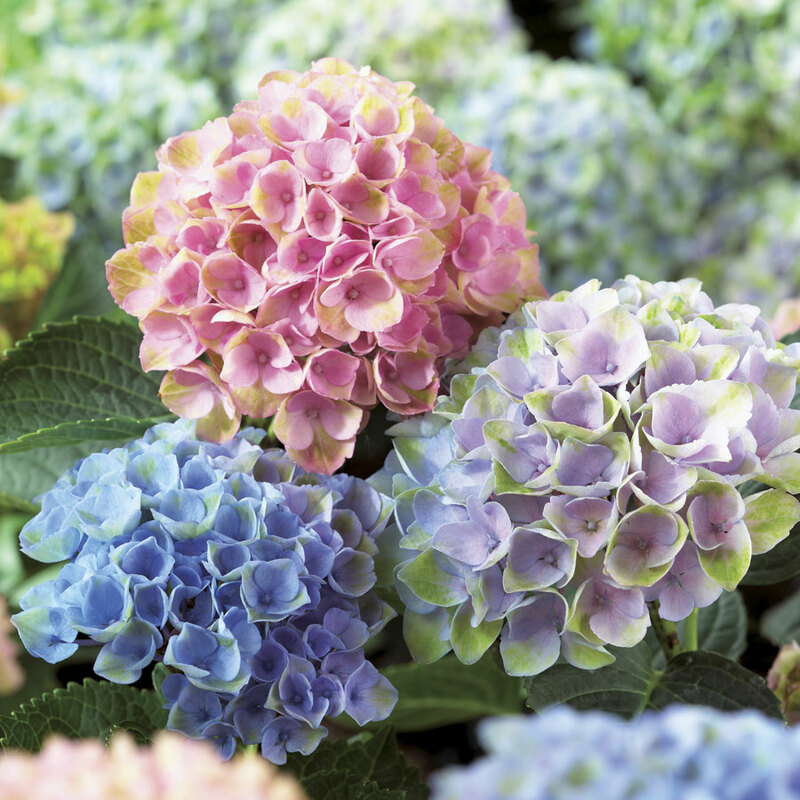 It's as if all the colors and combinations possible in the Hydrangea family have come together in a single shrub. "Everlasting™" is a Dutch series, and it was originally bred for the cut-flower market, so the emphasis is entirely on the blooms. 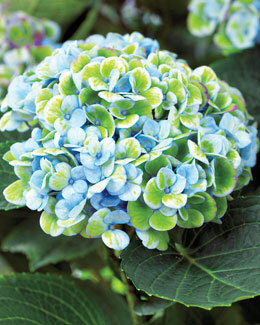 The flower stems are stronger and straighter than those of many other Hydrangeas, ensuring that the blooms won't flop or twist. The flowers are ultra long-lasting and quite large, especially when seen on the plant, which is just 3 to 4 feet high and wide. It needs consistently moist soil and a bit of shade. Do not allow it to dry out completely, but make sure the soil drainage is good. Zones 5-9. 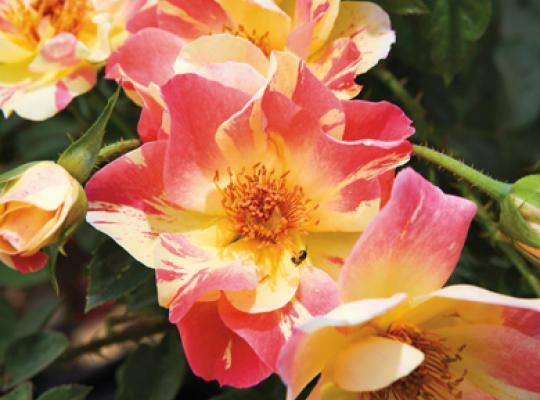 This climbing rose has flowers with soft pink and yellow stripes that repeat steadily all summer. It has a light green apple fragrance and a vigorious grower, reaching up to 12 feet. It has excellent disease resistance and with dark green, very glossy foliage. Bloom Season: spring to fall. 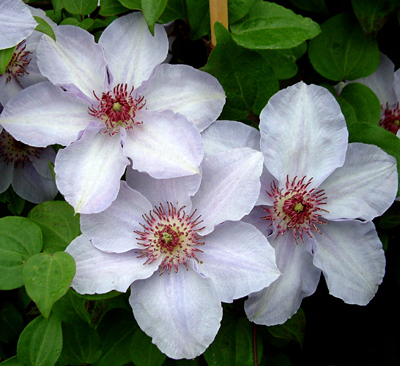 Clematis Still Waters™ - "Dependable performance and soothing lavender tones." Cultivar Name: 'Zostiwa'. Still Waters™ produces pale lavender-blue 4-inch blooms with maroon centers. It starts blooming in June and flowers freely, reblooming all summer. The pale blooms hold their color beautifully - a long-lasting play of light against warmer colors. It is a Group 3 Clematis, meaning that it blooms primarily on new wood (making it "easy" to grow because you can cut it back each year). Every spring you should prune it back to about 2 feet from the ground. Bred in the Netherlands, Still Waters™ is a Proven Winners® ColorChoice® plant chosen for its exceptional beauty and performance. To be selected for this group, it was thoroughly tested in trial gardens all around the world, and found to have superb health, vigor, and color. You commonly read that Clematis prefer light shade, especially on their roots. But I've also learned from experts that this "preference" is because many people don't plant Clematis correctly. Just like tomato plants, they should be planted with their crowns 2 – 3 inches deeper in the ground compared to the pot-dirt-level to encourage robust root growth. The first set of true leaves should be under the soil surface. This allows the plant to grow a strong root system – critical for a vigorous vine. I know, I know. This goes against everything we’ve ever heard about “don’t plant too deeply or you’ll kill the plant.” Tomatoes and Clematis break that rule. They sprout roots from nodes along the buried stem, and these extra roots strengthen the plants so that they can support more fruit (tomato) or climb more vigorously and produce more flowers (clematis). With proper planting, watering until establishment (and during periods of drought) and mulch to conserve soil moisture, Clematis should do just fine without "cool" or "shaded" roots. Remember to keep the mulch several inches away from the crown, where the vines emerge from the soil. Old habits die hard, but I've tried it a number of times and it really does work work. Clematis is "finnicky" no longer! 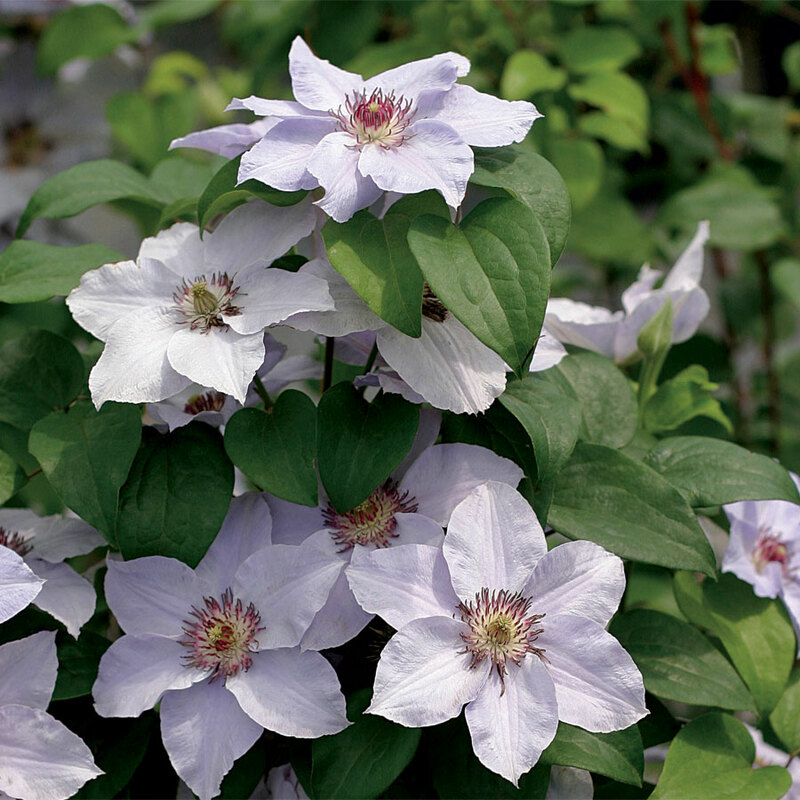 You can get Clematis Still Waters™ and a great selection of other Clematis and other types of vines and climbers mail-order from Brushwood Nursery. They propagate from cuttings, and ship again starting Sept through Nov (although last I checked they are out of stock for Still Waters™). I've been very pleased with their quality and I've tried small-flowered Clematis and non-vining Clematis varieties as well – both turn out to be unusual and beautiful (and low-maintenance as well). It’s a cheap and easy way to add flowers to your landscape, especially if you have trellises, gazebos, garden arches or stone walls for the vines to grow on. I ran across the US National Arboretum website again recently, and my attention was caught by the information on introductions to the Nursery trade that have come from there. There are some we all use and might be surprised came from the National Arboretum (like 'Green Giant' arborvitae, who knew?! ), and others that are worth looking out for this coming season, like 'Sun Valley' red maple. Here are the descriptions of a few of them. Malus 'Adirondack' (Crabapple) Five hundred open-pollinated seedlings of Malus halliana were artificially inoculated with fire blight under controlled conditions. Of the sixty surviving seedlings, several showed field resistance to scab, cedar-apple rust, and powdery mildew when exposed to natural inoculum from heavily infected, susceptible plants during eleven years of field trial. 'Adirondack' was selected from this seedling population in 1974 by Donald R. Egolf and released in 1987. 'Adirondack' has a narrow, upright-branched growth habit, abundant, small, persistent fruit, a slow to moderate growth rate, and multiple disease tolerance. This is one for confined spaces, an allee, or next to a walkway. Even the front border if there's anough space. Height and Width: 18 feet tall and 16 feet crown width at 20 years. Habit: Narrow obovate, upright-branched small tree. Maintains upright form with age. Foliage: Leathery dark green leaves. 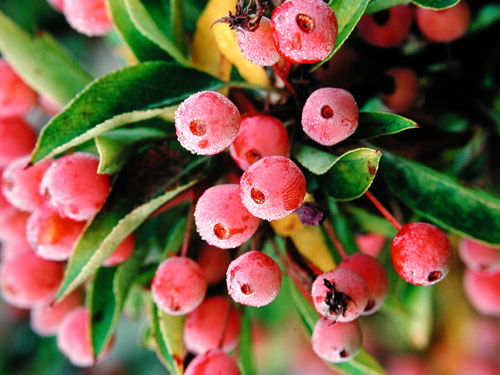 The foliage is highly tolerant to cedar apple rust, apple scab, and powdery mildew. Flowers: Dark carmine buds mature to a lighter red and open to white, waxy, heavy-textured, wide-spreading flowers with traces of red; slightly fragrant. Fruit: Abundant, bright orange-red, hard, small (1/2-inch) fruit persist until early winter. Relished by birds after softened by freezing. Adaptable to diverse soil, moisture, and climatic conditions. 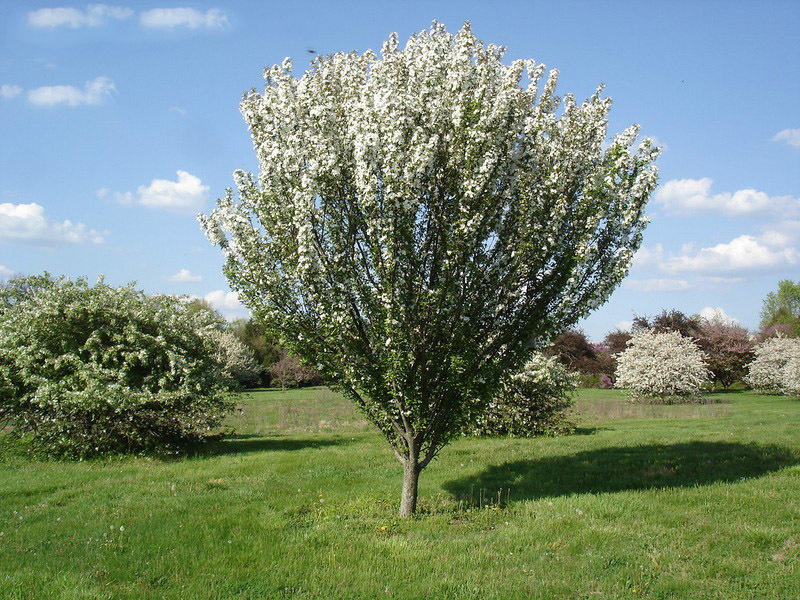 Requires virtually no pruning to maintain its shape nor chemical controls for the common crabapple diseases. Viburnum X burkwoodii 'Conoy' U.S.D.A. Zones 5b - 8; reliably evergreen in U.S.D.A. Zones 7 - 8. 'Conoy' is a selection from the cross of V. utile with V. x burkwoodii 'Park Farm Hybrid' made in 1968 by Dr. Donald Egolf at the U.S. National Arboretum. Selected for field trial and propagation in 1976, 'Conoy' was named and released in 1988. 'Conoy' is distinguished from other Burkwood viburnum cultivars by its compact growth habit, fine-textured, evergreen foliage, and persistent, abundant, glossy red fruit for approximately 6-8 weeks in the fall. Height and width: 4-5 feet tall and 7-8 feet wide. 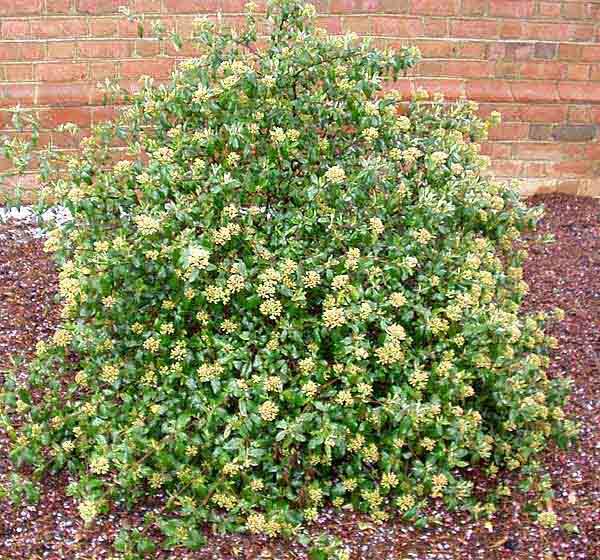 Habit: Spreading, dense-branched, evergreen shrub. Foliage: Extremely glossy, small, dark green leaves in summer with dark maroon tinge in winter. 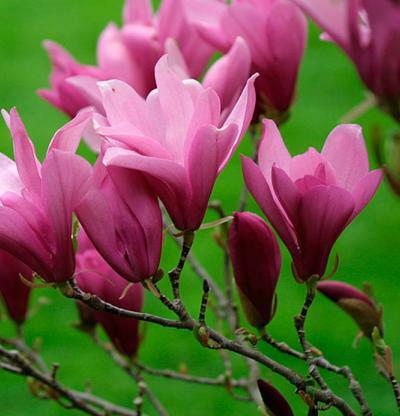 Flowers: Dark pink buds open to slightly fragrant, cream-white flowers in late April. Fruit: Slightly pendulous clusters of fruit ripen in mid-August to bright red before turning black in October. Grows best in full sun to partial shade in a heavy loam with an adequate moisture supply. Tolerates drought and drier soils extremely well. In 1967, a single plant reputed to be Thuja (standishii x plicata)was received from D.T. Poulsen, Kvistgaard, Denmark, and planted at the U.S. National Arboretum. This plant exhibited exceptional landscape quality and propagations were distributed. In the distribution process, the name and identity of this clone became confused with that of another arborvitae from the same source, T. occidentalis 'Giganteoides'. The identity of the exceptional clone as the T. (standishii x plicata) hybrid was resolved by Susan Martin, USNA, Kim Trip, New York Botanic Garden, and Robert Marquard, Holden Arboretum, through extensive records searches, nursery inspections, and isozyme analysis. 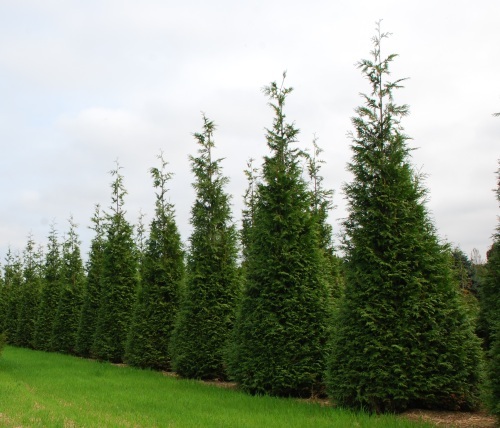 The name Thuja 'Green Giant' was selected to identify and promote this clone. 'Green Giant' is a vigorously growing, pyramidal evergreen with rich green color that remains outstanding throughout hardiness range. It has no serious pest or disease problems and has been widely grown and tested in commercial nursery production. Height and width: To 60 feet tall with a 12–20 foot spread at maturity; 30 feet at 30 years. Habit: Tightly pyramidal to conical evergreen tree; uniform appearance. Foliage: Dense, rich green, scalelike foliage in flattened sprays borne on horizontal to ascending branches; good winter color. Fruit: Persistent, oblong cones, approximately 1/2 inch length. Cones emerge green and mature to brown. Adaptable; grows in soil types from sandy loams to heavy clays. Requires little to no pruning. 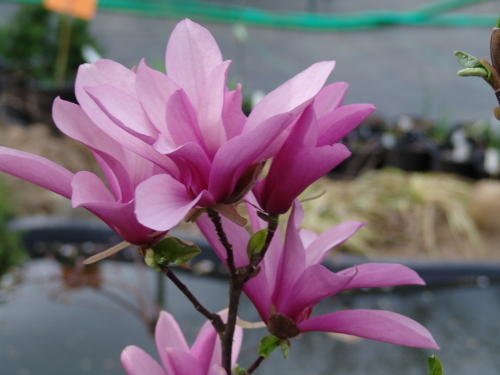 'The "Girl Magnolias'' are selections resulting from controlled pollinations of Magnolia liliflora 'Nigra' by M. stellata 'Rosea'; M. liliflora 'Reflorescens' by M. stellata 'Rosea'; and M. liliflora 'Reflorescens' by M. stellata 'Waterlily'. The crosses were made at the U.S. National Arboretum in 1955 and 1956 by William F. Kosar and Dr. Francis de Vos. All are F1 hybrids and reported to be sterile triploid selections. These magnolia selections bloom two to four weeks later than M. stellata and M. x soulangiana, reducing the possibility of late spring frost damage. Plants produce flowers with a variety of colors from reddish-purple to pink on white. The unexpected sporadic summer bloom adds landscape interest. Plants grow best in full sun to light shade; prefer loam soil with adequate moisture; tolerate poorly drained, heavy clay soils or dry areas. Viburnum X burkwoodii 'Mohawk' U.S.D.A. 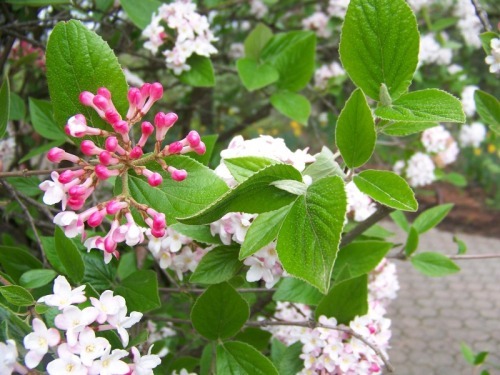 Zones 5b - 8 A backcross of Viburnum x burkwoodii to V. carlesii was made in 1953 by Dr. Donald Egolf. Seed produced from this cross was embryo-cultured to expedite seedling production. The cultivar 'Mohawk' was selected from this population in 1960 and released in 1966. 'Mohawk' is distinguished from related cultivars by abundant clusters of glossy, dark red flower buds that are ornamental for several weeks prior to full bloom. The waxy white flowers with red blotches on the reverse side of the petals have a strong, spicy, clove fragrance. 'Mohawk' has a fairly compact growth habit and foliage resistant to bacterial leaf spot and powdery mildew. 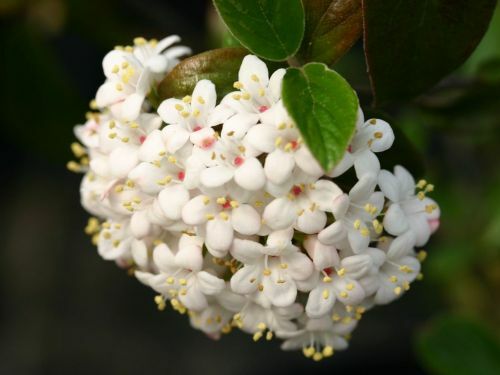 Definitely choose this as your fragrant viburnum if you see it in the Nursery! Height and width: 8 feet tall and 10 feet wide. Habit: Deciduous shrub with spreading branches. Foliage: Glossy, dark green leaves turn a brilliant orange-red in autumn. The foliage is highly tolerant to bacterial leaf spot and powdery mildew. Flowers: Brilliant, glossy red flower buds appear several weeks before the flowers begin to open in late April, extending the effective ornamental period by several weeks. The red of the flower buds contrasts well with the white of the opened flowers and is retained on the reverse of the flower. Flowers have a strong, spicy, clove fragrance. 'Mohawk' grows well in many exposures and soils, but performs best in sun with moderate moisture and well-drained soils. Acer rubrum 'Sun Valley' U.S.D.A. Zones 4–7 'Sun Valley' resulted from a controlled cross made in 1982 by A.M. Townsend as part of a tree genetics research project examining the inheritance of fall color and leafhopper resistance. 'Sun Valley' is a cross of A.rubrum 'Red Sunset' and A.rubrum 'Autumn Flame'. Released December, 1994. I saw a whole row of these about 2 years ago at Prospero Nursery in full color, and they were so beautiful. Completely symmetrical shape and some hints of orange in their red color. They really looked like a sunset. Unfortunately, at the time I didn't know anything about this hybrid, so we didn't end up buying one, to my eternal regret! Height and Width: 21 feet tall, 10 feet wide at 10 years. Habit: Medium-sized deciduous tree. Symmetrical ovate crown. 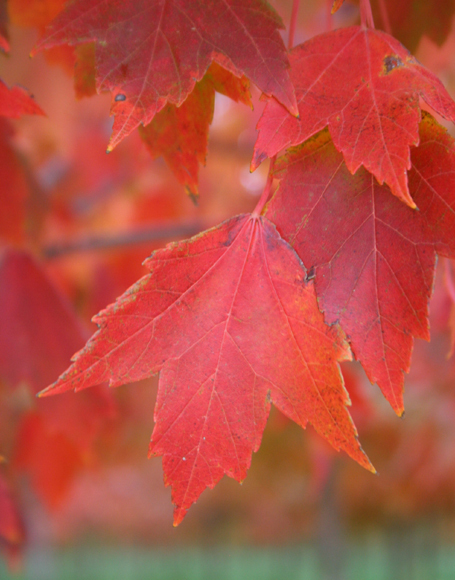 Foliage: Brilliant red, exceptionally long- lasting (2 weeks or more) with peak color in the 3rd to 4th week of October, about 1 week before 'October Glory'. Medium green leaves in summer. Bark: Light grey and smooth when young; turning dark grey with age. Adaptable to a wide range of soil conditions. Prefer slightly acid, moist soils.